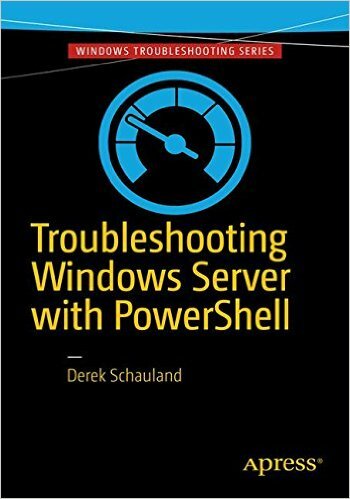 Over the past months, I have been working with Apress on a new book titled “Troubleshooting Windows Server with PowerShell” which is available for pre-order at a bookstore near you today and will hit the mainstream on June 7 2016. This project was really fun to work on (as books go) and I am looking forward to feedback and to see how it goes once available. I worked with a great editorial team at Apress as well as an awesome co-author, Donn Jacobs. Our technical editor was PowerShell MVP Adam Driscoll. Thanks guys for helping to get this project accomplished. Who knows, maybe we’ll do it again soon.